A telecoil picks up the electromagnetic signal from a sound source such as a microphone or a PA system. The signal is processed by the hearing aid or cochlear implant, then passed on to the auditory nerve as sound. 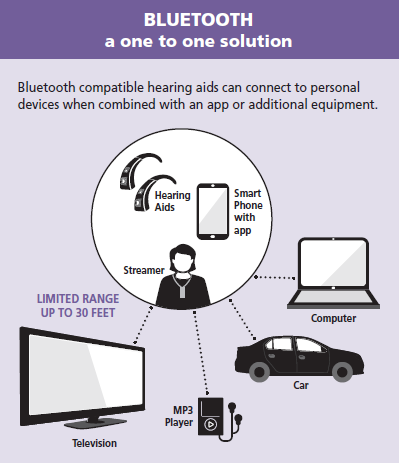 The sound is customized for each listener’s hearing loss, which provides especially clear sound. Telecoils help eliminate background noise and increase speech understanding. Many hearing aid wearers don’t know if their hearing aid has a telecoil or how to use it. Ask your audiologist if your hearing aid has a telecoil, and make sure it’s activated. 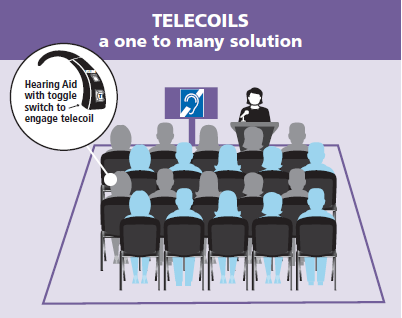 The telecoil is a vital bridge for public hearing access, allowing you to connect to assistive listening systems (ALSs) in theatres, airports, houses of worship, and dozens of other public spaces. A telecoil connects your hearing aid to a loop without checking out additional Assistive Listening Device (ALD) equipment–you simply switch your aid or CI to telecoil mode (or T mode). Telecoils can also connect you to your home or TV loop. 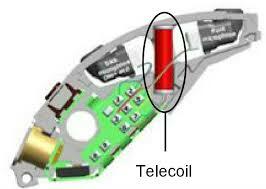 Note that Bluetooth and telecoils are different technologies and are designed for different situations. Bluetooth helps you connect to devices such as your cellular phone, but it has a limited range. A telecoil will help you hear better in large venues.